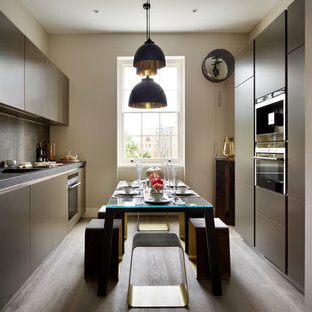 Photo of a large contemporary kitchen/dining room in London with dark hardwood flooring. Inspiration for a traditional enclosed dining room in London with beige walls and carpet. 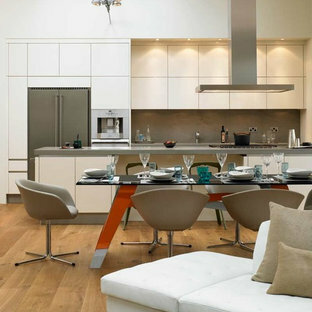 Design ideas for a modern galley open plan kitchen in London with flat-panel cabinets, white cabinets, grey splashback and stainless steel appliances. 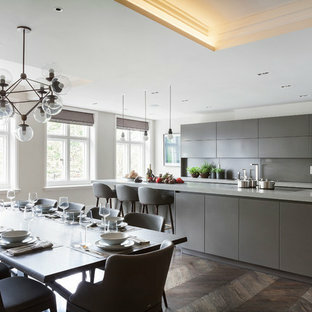 Photo of a contemporary dining room in Surrey. This is an example of a medium sized contemporary galley kitchen/diner in Essex with a submerged sink, flat-panel cabinets, grey cabinets, grey splashback, integrated appliances, medium hardwood flooring and no island. Design ideas for a traditional dining room in Surrey with beige walls. 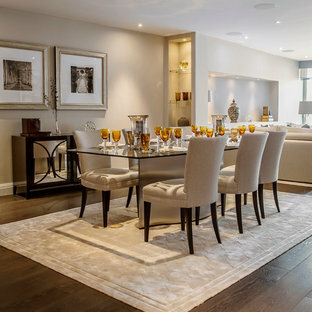 Classic open plan dining room in London with beige walls and dark hardwood flooring. 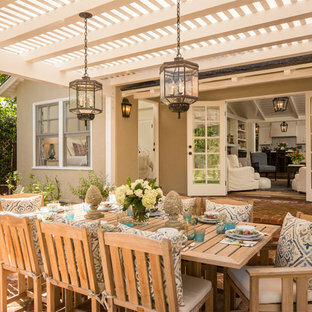 This is an example of a traditional patio in Los Angeles with a pergola. Design ideas for a rustic conservatory in Other with dark hardwood flooring, a stone fireplace surround, a standard ceiling and brown floors. Design ideas for a contemporary terrace and balcony in New York with a potted garden and no cover. This is an example of a contemporary dining room in Dallas with grey walls and dark hardwood flooring. This is an example of a large traditional enclosed dining room in Richmond with grey walls, dark hardwood flooring and a standard fireplace. Classic living room in Other with beige walls, a standard fireplace and a stone fireplace surround. Design ideas for a traditional dining room in Other with blue walls. Rustic dining room in Minneapolis.